This week, I had a few epiphanies with regards to using Microsoft SharePoint. Although I have been training the majority of new teacher website requests using Google Sites, we continue to have a large contingent of teachers using SharePoint for their site construction and we continue to use the platform for many department Intranet and special project sites. Forced to tool around the admin site of things, I made a few interesting discoveries that will help many of our teachers and add functionality to several sites. These features may not be anything new to you, so feel free to bypass this post. Otherwise, read on for the eye-opening discoveries. One of our teachers had collected a sizeable number of links on his course site and asked for a way to copy these links onto another site. Looking at the standard links library, there didn't appear to be an easy way to accomplish this request. Unlike Document Libraries, links libraries did not have the wonderful "Open with File Explorer" option that enabled simple drag and drop capabilities. Instead, the action I choose to explore instead was the Edit in Datasheet option (found under actions). In this view, one can copy/paste URLs (TIP: select them in their column, not as entire rows) to and from different link folders. You may have to switch back to standard view a few times, as the folder names will not be shown, though the folder order is preserved. Again, not as elegant as a drag/drop, but at least it is functional. Similar to many organizations, we have shared document folders on our server, which house items that need to be accessed by various members of a department or interdepartmental. Although we are moving more towards using Google Docs for this kind of thing, the familiarity of our current system and a vast amount of content prevents a full switch from taking place. That being said, a major deterrent to using our server for storage is that one can only access these documents when in the building. SharePoint sites offer a solution, but the perceived clunky design of the platform often scares users away or transforms what should be simple tasks into more complicated ones. I was asked to investigate a possible document storage solution for a project, and I quickly discovered an underutilized feature in SharePoint that has potential to really support our user base. When creating a document library, you are given the option to "allow this document library to receive e-mail." For one reason or another, this feature was not working for us before, and I never really thought much about it since. For this project, I realized that it was the perfect solution, as teachers can send attachments via email and their items will go directly into a Document Library organized into folders by their last name. You have the option to group by e-mail subject as well (see Incoming E-mail settings in the document library settings), but I really like the grouping by sender as it involves the least amount of work for the end user. 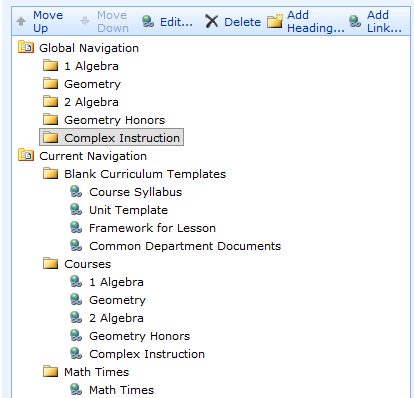 Our teachers simply need to send an item to an email address that you designate, and the attachments will soon appear. Project submissions, group collaboration documents, absence lessons plans, all are potential uses for this feature and really only scratch the surface. Lastly, this one was a simple discovery, but for some reason really plagued me for a little bit. When we made some changes to the admin side of SharePoint recently, a few familiar menu items disappeared from the Site Settings control panel. 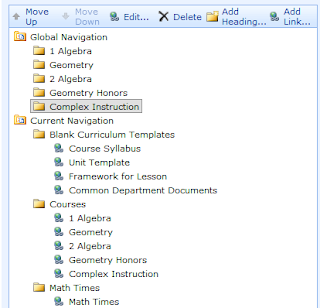 Namely, the Quick Launch menu and the Top Link menu were no longer to be found, and these were quite important in helping teachers organize their site. I soon realized that these were both lumped into the appropriately named "Navigation" menu found under Look and Feel. Here, you can easily edit, delete, and add links to your website with ease, and the menu toolbar is helpful in explaining your options. 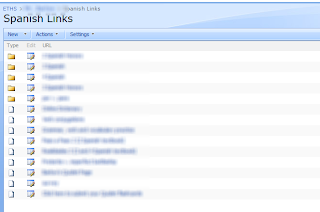 One somewhat hidden component is the "Show subsites" checkbox at the top of the page. This is unchecked for us as a default, and only when checking this box do our users get to see additional subsites in their navigation menu. This was an important discovery as many teachers create separate sites for each of their courses.